100 Pages in 30 Days: Script Frenzy! Script Frenzy is an international writing event in which participants take on the challenge of writing 100 pages of scripted material in the month of April. As part of a donation-funded nonprofit, Script Frenzy charges no fee to participate; there are also no valuable prizes awarded or "best" scripts singled out. Every writer who completes the goal of 100 pages is victorious and awe-inspiring and will receive a handsome Script Frenzy Winner's Certificate and web icon proclaiming this fact. What I hadn't realized until recently: in addition to screenplays, stage plays, TV shows, and short films, Script Frenzy also includes graphic novels. Hm. I'm SO tempted. I've just started work on a cartoon-heavy novel for middle grade readers which is a sort of "Diary Of A Wimpy Kid meets Captain Underpants." Right now I'm focusing on the script, with very rough sketches of the graphics. Unlike NaNoWriMo, Script Frenzy doesn't include a wordcount and also doesn't require you to start from scratch. My novel isn't in comic book format all the way through, which is why I'm still calling it a novel. However, there are going to be a LOT of mini-comic strips and fun graphic elements throughout, which is why I would be relying on scriptwriting format just as much as regular manuscript format. What about the rest of you? 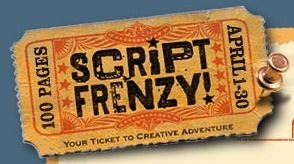 Are you planning to do Script Frenzy? I'm thinking about it. I try to wean myself from these insane deadlines in favor of a regular writing habit, and I don't like writing screen plays but - then I saw that you can do a graphic novel. I'm definitely moving my pen (or rather my keyboard) for that too! I already participated in NaNo for the first time in my life, and I will do the same in Frenzy as well. Such a great way to get motivated knowing so many are actually doing the same thing as you are right now...or not really the same thing, as that's the best part of all, you creating new stuff daily. I never know where it will end up until it says "The End" or not...go figure, the wheel turns, the clock burns and you just have to finish in the deadline...on time. With or without rhyme...That's just Sublime!! I really hope you do it! As for me, I have no plans this year. But, I may stretch myself next time around and give it a go. I'm really glad you mentioned this, I've passed the information on to my daughter. She's the screenwriter in the household. I am definitely doing Script Frenzy! I wasn't certain until two days ago when I finally came up with a plot while talking to my 11-year-old son. He doesn't like the fact that Hamlet dies at the end of the play. So he asked me to rewrite Hamlet in a modern setting, and have Hamlet live in the end. After thinking about it, I decided I'd try. I'm doing Script Frenzy! I'm ShireenJ on there just like NaNoWriMo. After having so much fun writing a novel in 30 days last November, I thought I'd try writing a screenplay for the first time. I'm going to adapt my first book "Lifeliner: The Judy Taylor Story" into a web film. I was inspired after watching Dr Horrible (without the musical part). I'm starting to get excited! I'm in. Why, I have no idea. I'm doing TV spec scripts ("Castle" and "Mad Men") because that's what I know, having been a television writer years ago. I still don't know why I'm doing it, but I'm doing it. Add me as a writing buddy if you want, and I'll add you back. Look for creative.reboot . I'm signed up and ready to start Scriptfrenzy tomorrow morning. I have a date with myself at the local coffee shop where I'm planning on having my play debut!